It’s been a long wait. A very long wait. But now, the waiting’s over. Which means we can go back. The long wait to which I refer is the stretch between the releases of Overseer (1998) and 3 Cards to Midnight (2009). Overseer was, of course, the last of the Tex Murphy games published by Access Software and 3 Cards to Midnight is the debut publication of Big Finish Games. What these games have in common is the participation of Aaron Conners and Chris Jones. There’s nothing like losing the rights to a character like, say, Tex Murphy, to produce a longish fallow spell. After a decade-plus of Microsoft and then Take-Two Interactive doing nothing with the character, the rights to Tex Murphy again rest in the hands of his creators, Conners and Jones. Rumor has it that a new Tex adventure is underway at Big Finish Games bearing the working title of Fedora. If the rumor is true, I hope the boys have better luck reviving Tex then they had with 3 Cards to Midnight. I approached this review with a great big dollop of trepidation sitting right in the middle of my psyche. I had good memories of the past work of Conners, Jones, et al., and was concerned that 3 Cards would have trouble measuring up to those memories. Come to think of it, I had many of the same concerns with Courtland Shakespeare’s Forever Worlds. And we know how that turned out. Then again, maybe I was worried about nothing. I have no idea how much cash Overseer consumed during its production or if it managed a return on that investment. Going light on production with 3 Cards might go a long way to assuring a profit and keeping the doors at Big Finish Games open. But how light? How thin could the production get without making the entire enterprise seem cheap? This is, after all, 2009. Game development has gone global, high production values seem like off-the-shelf components, and casual games have long since outgrown their reputation as cheesy time wasters. Expectations, in other words, have risen. Unfortunately, 3 Cards, like bread made with tired yeast, rises only modestly, grinding to a halt at a level well below that of current expectations and standards. I mean, when your attention wanders to the rendering of the game’s characters’ teeth, something’s amiss. Not that it starts off that way. As it begins, the story of 3 Cards seems promising, if more than a little familiar. Jess Silloway, a young woman suffering from amnesia, uses the services of a mysterious man and a deck of tarot cards to regain her memory. We learn her life story as she does. Or, if we’re not feeling charitable, we do endless word games in hopes of getting a piece of dialogue that advances the story of her life. 3 Cards is sort of a hidden object game crossed with a word association game. The player is presented with scene after scene full of junk. Worse yet, often blurry junk. It’s the usual HOG bouillabaisse of unrelated objects peeking out from behind curtains, stuffed upside down in golf bags or seeking cover by being exactly the same color as the object they find themselves sitting on. Like other hidden object games, there is a list of words. The twist is that the words you see on the screen are either the beginning or end of a two word phrase and you have to find the object that completes the phrase. One might, for example, be given the word HOT with the requirement that the phrase be completed by clicking on an image of a DOG within the scene or a TAMALE or whatever else happens to make sense with HOT. It’s not much but it’s the bulk of the gameplay in 3 Cards. Let me repeat that: the bulk. 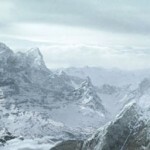 There are seven acts in the game and each act features three scenes. Each of the scenes must be explored three times for three different sets of words. It adds up. When one has found enough words, it is time for a change of pace in the form of twiddle puzzles. Twiddle puzzles that come with the odd flatness of animation that is practically the trademark of Adobe Flash. It’s like everything in the puzzle had been cut out of paper and the only real puzzling is getting the pieces of paper stacked in the right order. Finally, when the all the phrases have been made and all the pieces of paper sorted, it is time for the end. The end is when you determine your fate by picking a couple tarot cards. Choose wisely or your score will reflect how little attention you’ve been paying. All of this drama is presented in a portion of an 1024×768 screen that shrinks to roughly 1/7th that size whenever it is necessary to cut away to a movie. For gamers too young to remember, there was a time when all games were like that. Motion meant small. Perhaps this is an effort to bring back that magical time. Or maybe Good Old Games deserves credit for bringing back that magical time by recently releasing the Tex Murphy games fitted out to run on XP and Vista boxes for a fraction what the games cost back in the day. Which produces an interesting dilemma. Buy the Tex Murphy games on the cheap to see what all the shouting was about or download 3 Cards to see what Conners and Jones have been up to lately? While I’m glad I took the time to check in with the duo responsible for Mr. Murphy, I’ve had more fun with just about any of the recent offerings of Big Fish Games that’ve caught my eye. 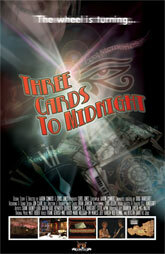 3 Cards to Midnight, like Forever Worlds, is a minor work by some major talents. Here’s hoping they either get back to making magic with Tex or figure out how the world has changed since Tex hung up his fedora. ← All the Cool Kids are Doing It! Hmm. I read a semi-glowing preview concerning Three Cards to Midnight a few months ago on *cough* another site. I went up there looking for the expected review of the finished game tonight, and found *nada*. So then I came here. Have to say, it’s what I expected to find. Though of course, I’m not especially happy with that. Thought the Conners/Jones team could have done much better, especially given 10 years or so to devise their plans for a new adventure. Thanks to Mr. Lipid for being his old honest self. I won’t be going near this one with a 10-foot pole. Not even to review. Life is too short. What Toger said. I actually nodded off at about the same point in the game that she got tired. Loser. Hi Metzo! I’m glad to see you are still around. I did play through 3 Cards to Midnight, twice, because I did a pictorial walkthrough for it. What MrLipid did not mention was that some of the word associations made no sense ‘tall, and many others involve some regional phrase or slang that would not be understood by many, especially those whose first language is not English, no, make that American English. But the story really wasn’t bad (although the main character’s voice actor sounded like she was jonesing for her next fix), and I enjoyed a couple of the in-between-chapters puzzles. I guess my end rating would’ve been roadkill as well, or maybe, if I was in a charitable mood that day, just a rotten egg. Hm, I think I buy the old Tex Murphy titles sooner or later, an updated engine for XP compatibility is tempting. So far I’m not a fan of hidden object games and I’m a non-native English speaker, so I guess it’s not meant for me.